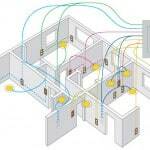 To prevent the potential for electrical shocks, all circuits should have a grounding system. In 1962, electrical codes changed, requiring all 120-volt circuits to be grounded; in 1999, codes changed again, requiring all 240-volt circuits to be grounded. 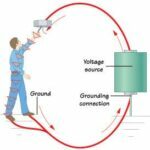 Grounding simply means that all metal portions of a circuit come in contact with the ground, which renders their voltage 0, preventing electrical shock or fire should the electrical malfunction. If you attempted to change the lightbulb, for example, the electrical current in the fixture would attempt to become grounded, using you as the pathway. This would result in you getting quite a shock. This same condition could occur anywhere electricity and metal come together. 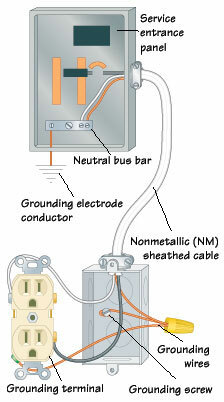 However, none of this could happen if the circuit had a grounding system, usually a wire that connects to the neutral bus bar in the service panel and to the light fixture’s metal housing. When the current attempted to complete its circuit through the grounding wire, the fuse or circuit breakers would shut down all flow of current, protecting the circuit and your home. For added protection, instead of using the receptacle shown, you could choose a ground-fault circuit interrupter (GFCI) receptacle. When this type of receptacle detects an unequal flow of current, it immediately (in 1/40 of a second) shuts down the circuit, rendering all devices plugged into that particular receptacle, as well as all other devices “downstream,” powerless. While GFCI receptacles are not required throughout a home’s entire electrical system, current electrical codes dictate that they be installed in all locations where there is moisture, including bathrooms, kitchens, decks, and patios.